If you were born in the month of June, you are lucky enough to have three birthstones to call your own. June is one of only three months (the others are August and December) that has three birthstones, giving you a variety of beautiful birthstone choices. The June birthstones are pearl, alexandrite and moonstone. With so many attractive options, individuals with June birthdays can have a birthstone that fits their mood or budget, due to the different colours and price points these gems offer. This enchanting June birthstone originates from oceans, lakes and rivers around the world. It is a timeless wardrobe staple, beloved by women of all ages. The origin of pearls fascinated our forebears. Ancients from the Middle East believed that pearls were teardrops fallen from heaven. The Chinese fancied that the June birthstone came from the brain of a dragon. Christopher Columbus and his contemporaries thought that molluscs formed pearls from dew drops. Pearls are organic gems that grow inside the tissue of a living saltwater or freshwater mollusc (either an oyster or a mussel). Natural pearls form when the mollusc secretes a substance called nacre around an irritant such as a piece of sand or a parasite that has invaded its shell. Cultured pearls are a product of human intervention. Technicians implant a piece of mantle tissue alone (common for freshwater cultured pearls) or with a mother-of-pearl shell bead (all saltwater) into a host mollusc. The mollusc covers the irritant with nacre, just like a natural pearl. Cultured pearls are raised in pearl farms – saltwater or freshwater operations where the molluscs are cleaned, protected from predators and eventually harvested. Thousands of years of pearl fishing have decimated the natural pearl beds, so cultured pearls account for the vast majority of pearl sales today. 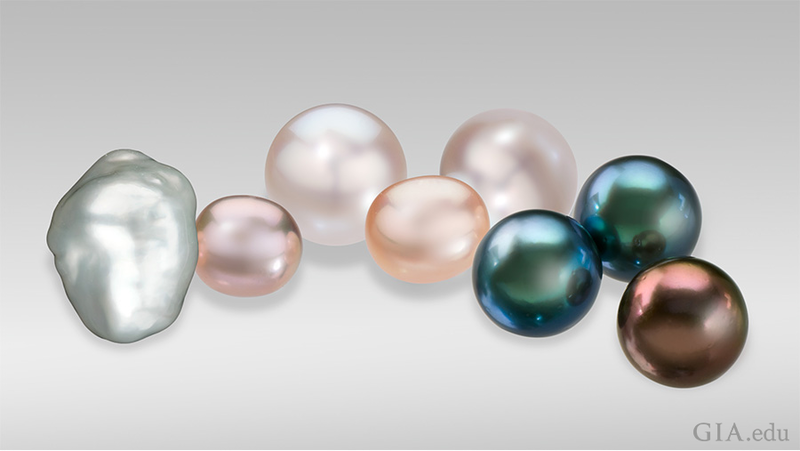 These cultured pearl birthstones come in a dazzling array of sizes, colours and shapes. Pearls have long been associated with purity, humility and innocence. So it may be said that the meaning of the June birthstone is "sweet simplicity". As such, pearls were traditionally given as a wedding gift. The pearl birthstone was also thought to have beneficial properties. In the ancient Sanskrit text the Atharvaveda, pearls were said to bestow long life and prosperity. In Asia, pearls were believed to help alleviate indigestion and haemorrhages. Some 19th century Arab physicians maintained that pearl powder improved eyesight, quieted nervous tremors and eased depression. One of the most famous natural pearls is the 50.56 carat (ct) La Peregrina. About the size of a pigeon’s egg, the drop shaped pearl was discovered in the 1500s in the Gulf of Panama. It became a prized possession of European royalty. Richard Burton eventually gifted it to Elizabeth Taylor in 1969; Christie’s New York auctioned the Cartier necklace containing La Peregrina for $11.8 million in 2011. Warm waters… clear skies… dramatic scenery – it sounds like a dream beach holiday, don’t you think? It’s also an accurate description of where you'll often find these pearl birthstones. 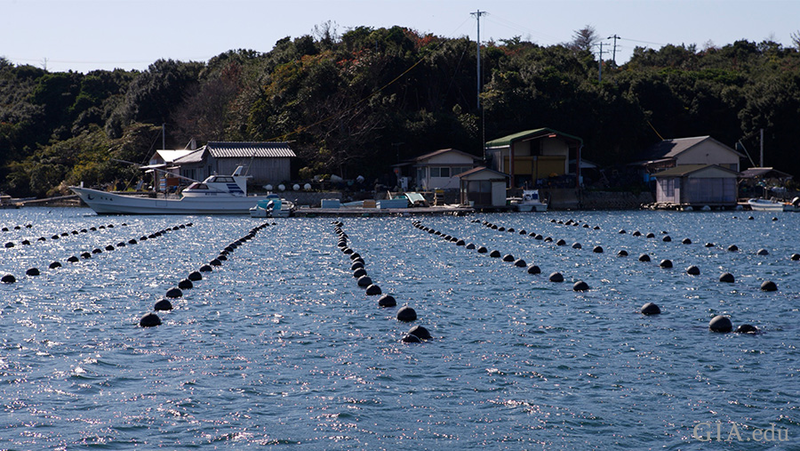 Pearl-bearing molluscs fail to thrive in polluted waters, so pearl farms are usually located far from civilisation – and often in breathtaking settings. Saltwater cultured pearls are grown in many areas around the world. Akoya cultured pearl farms are primarily found in Japan and China, especially along the southern coasts of Guangdong and Guangxi provinces. South Sea cultured pearls are farmed from the northern coast of Australia throughout Indonesia to the southern coast of South-East Asia, with large operations in the Philippines as well. The Gambier Islands and the Tuamotu Archipelago, both part of French Polynesia, are two locales where the rich black Tahitian pearls are cultured. China is the dominant source of freshwater cultured pearls. Natural pearls have been found in the Arabian Gulf (Persian Gulf) for at least 5,000 years, while divers have been recovering the June birthstone from the Red Sea since 300 BCE. The Strait of Mannar has been providing pearls since 2000 BCE. Starting in the 16th century, during Spanish colonial rule, large quantities of pearls were recovered from the waters off Mexico, Central America and what is now Venezuela. Only small quantities of pearls are found in any of these areas today. Pearls are 2.5 to 3.0 on the Mohs Scale of hardness, so they are a comparatively soft gem and require special care. Store them separately from other gemstones and metal jewellery to prevent scratching. Never store your pearl birthstones in a plastic bag — plastic can emit a chemical that will damage their surface. Always apply perfume, hair products and cosmetics before putting on your pearl jewellery. The best way to clean your June birthstone: Use a soft, damp cloth, ideally after each time the pearls are worn. Today, cultured pearls can be found in a wide variety of shapes, colours and sizes (here, measuring between 9 mm and 23 mm). From left to right: a baroque cultured pearl; small fancy pink and peach off-round freshwater cultured pearls; round white Australian cultured pearls; and black and brown Tahitian cultured pearls. Photo: Robert Weldon/GIA. Now that you know a little more about the history of pearls and where this June birthstone comes from, you probably have a deeper appreciation for these classic beauties! If we’ve whetted your appetite for the pearl birthstone, consider adding five essential pearl jewellery pieces to your collection. But before you begin shopping for pearls, make sure you learn about the GIA 7 Pearl Value Factors™ and what to look for with this handy Pearl Buying Guide. Moonstone is the best-known gem of the feldspar group of minerals. It is renowned for its adularescence, the light that appears to billow across a gemstone, giving it a special glow. The finest moonstones show a blue sheen against a colourless background. This June birthstone has been associated with both the Roman and Greek lunar deities. Hindu mythology claims that it is made of solidified moonbeams. Moonstone is often associated with love, passion and fertility; it is believed to bring great luck. Great designers of the Art Nouveau era (1890s–1910s), such as René Lalique and Louis Comfort Tiffany, featured moonstone in their fine jewellery. Moonstone came to the forefront again during the 1960s “flower child” movement and with New Age designers of the 1990s. Moonstone can be found in a wide variety of places. This includes parts of the United States, such as New Mexico, North Carolina and Virginia. The most important world locations for moonstone are India and Sri Lanka, but sources also include Brazil, India, Sri Lanka, Madagascar, Myanmar and Tanzania. Moonstone is a 6–6.5 on the Mohs scale of hardness and has poor toughness. It may crack when exposed to high heat. Therefore, ultrasonic and steam cleaners should not be used on your moonstone. The best option for cleaning is warm, soapy water with a soft brush. Alexandrite is the rare variety of the mineral chrysoberyl that changes colour in different lighting. Most prized are those alexandrite birthstones that show a vivid green to bluish green in daylight or fluorescent light, and an intense red to purplish red in incandescent light. Major alexandrite deposits were first discovered in 1830 in Russia’s Ural Mountains. The gem was named after the young Alexander II (1818–1881), heir apparent to the throne. Alexandrite caught the country’s attention because its red and green colours mirrored the national military colours of imperial Russia. When certain types of long, thin inclusions are oriented parallel to each other in this June birthstone, they can create another phenomenon, called chatoyancy or the cat’s-eye effect. Few gems are as fascinating – or as stunning – as cat’s-eye alexandrite. The spectacular Ural Mountain deposits were eventually mined out, and now most alexandrite comes from Brazil, Sri Lanka and East Africa. The newer deposits contain some fine-quality stones, but many display less-precise colour change and muddier hues than the 19th-century Russian alexandrites. Because of its scarcity, especially in larger sizes, fine-quality alexandrite is one of the more expensive coloured gems. This June birthstone is relatively hard—8.5 on the Mohs scale. It has excellent toughness and no cleavage, which is a tendency to break when struck. This makes it a good choice for rings and other mountings subject to daily wear. An alexandrite engagement ring would be a unique gift for a bride-to-be born in June. Although it is best to clean your June birthstone in warm, soapy water, ultrasonic and steam cleaners are usually safe as well. June is a month for celebrations, be it weddings, anniversaries, graduations or birthdays. And what better way to celebrate than with a June birthstone. Those who were born in June are lucky to have three gorgeous birthstones to choose from. Now you know how to pick one of these birthstones for yourself or a loved one born in the month of June. Interested in exploring additional birthstones?